Canon 1DX & 800mm f/5.6 lens + 1.4x III extender ... 1120mm, 1/800, f16, ISO 3200, exp comp +1 1/3. Heavy crop (around 25% of original image shown here). Haven't been around awhile, and noticed a dearth of grizzly images! I've been to Katmai a bunch of times, and it seems like every trip can produce an unexpected image or two. Good to see you, Pete, and good to see some of the Katmai bears again - especially such a great action shot. 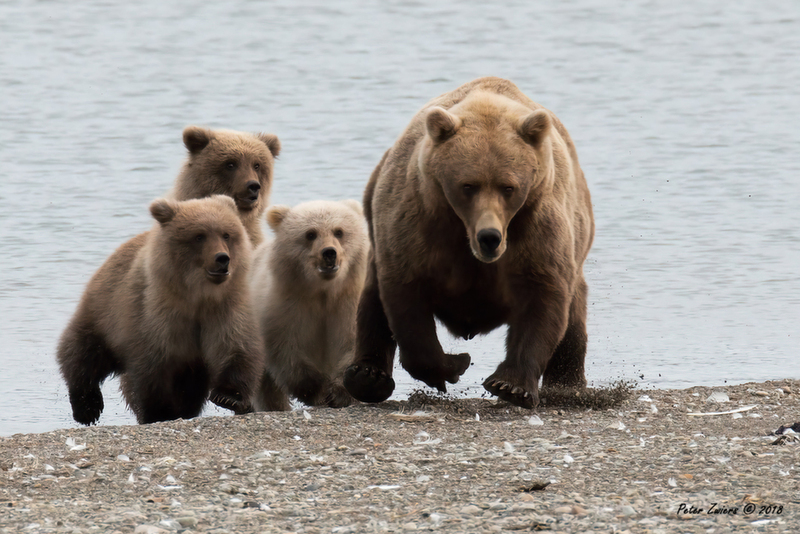 Lovely perspective to get this family approaching on the gallop, and the sow has really got her hands (paws) full with these triple trouble cubs! What a charmer-love the galloping family, all in focus. Cute factor #1 !